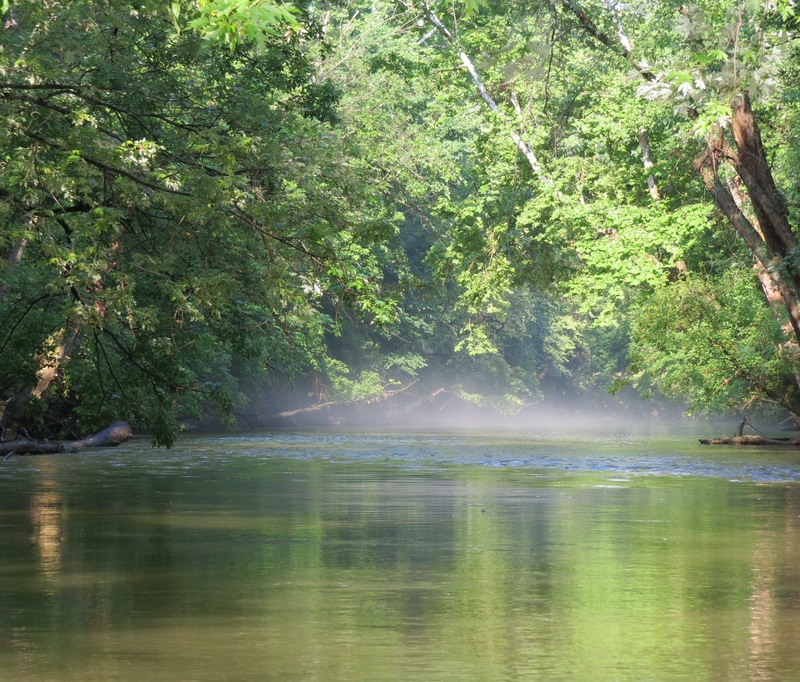 A mist rises off the river near the Greentown Indian village site. When I launched a rented canoe on Black Fork of the Mohican River 34 years ago, I had no idea where I was or where I was going. When I came to the confluence of Clear Fork, where the mainstream of the Mohican River begins, I stopped to ask directions. However, I did know the second the canoe slipped free of the bank and began to drift downstream that this was where I wanted to be and this was what I wanted to do. I found my life’s passion at what was then Mohican Canoe Livery on the last mile of Black Fork. Still under the same management, the livery is now part of Mohican Adventures recreational complex. For this week’s article in my series on the forks of the Mohican, I decided to make a pilgrimage of sorts from Charles Mill Dam to the place of my rebirth, the place where I first put a canoe in the water. 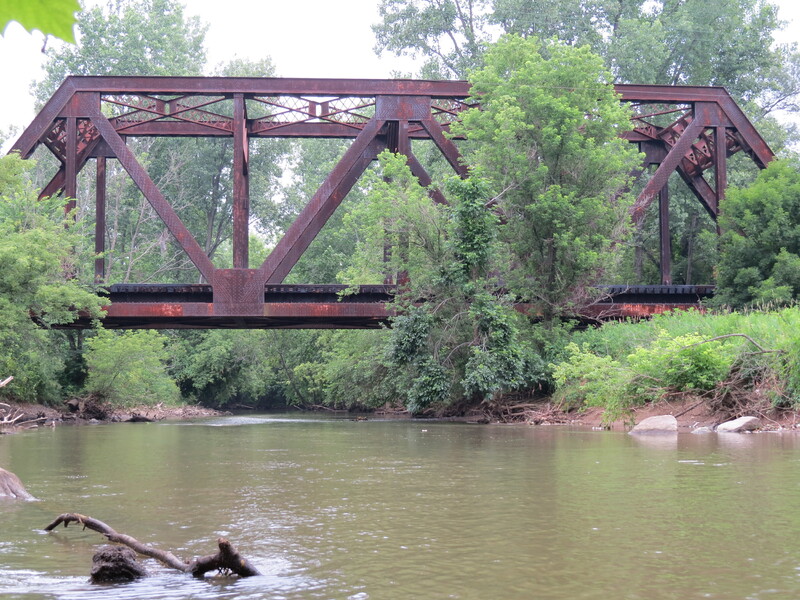 At more than 58 miles, Black Fork is by far the longest of the Mohican River forks. Unfortunately, much of it — the stretch above Charles Mill Lake and Dam — is choked with logjams and fallen trees not particularly attractive to paddlers. We’ll take a look at that section next week. It’s about 19 miles from Charles Mill Dam near Mifflin to the Clear Fork confluence south of Loudonville. While not as pristine as the lower Mohican River, this stretch of the Black Fork offers canoeists and kayakers more solitude than the Loudonville to Frye’s Landing section that’s so popular with day paddlers. Some of the Loudonville-area liveries offer trips on Black Fork with put-in sites as far upstream as County Road 1075 north of Perrysville. Logjams downstream from the dam — why most paddlers opt to put in further down, at the SR 603 bridge. During tourist season, the section served by the canoe liveries is kept free of logjams and deadfalls. Paddlers will encounter some logjams and downed trees between Charles Mill Dam and County Road 1075. However, most obstructions can be gotten over or around easily. The exception is the stretch from the dam to the State Route 603 bridge, which is narrower and more prone to logjams. For that reason, a lot of paddlers opt to put in two miles downstream at State Route 603. Black Fork undergoes a personality change just past the Rocky Fork confluence, with plenty of gradient drops, riffles, chutes and turns. It’s rated International Class I and suitable for beginners at normal water levels. The river level was perfect for my three-day “pilgrimage trip” in early July. 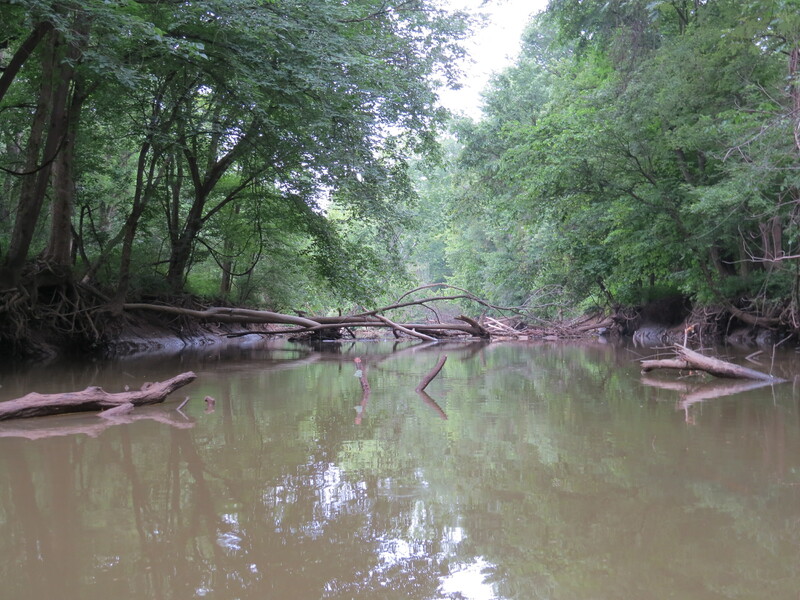 Online river gauges have taken a lot of the guesswork out of paddling the Mohican. For Black Fork between Charles Mill and the Clear Fork confluence, the gauges to watch are Black Fork below Charles Mill Dam, Melco (at Rocky Fork) and Black Fork at Loudonville. The Charles Mill and Loudonville gauges can be accessed at http://waterdata.usgs.gov/oh/nwis/rt and the Melco gauge at http://www.lrh-wc.usace.army.mil/wc/musns.htm (listed under Walhonding River). I knew there was a sizeable logjam below the dam, so I opted to start my journey from the Mifflin Township Road 1265 bridge. I was able to wend my way through the maze of downed trees without having to get out of my canoe. Just downstream of the bridge, I spotted an immature bald eagle, one of many I’d see during the trip. The forecast called for rain and Mother Nature delivered. I’d stopped to take a few photos at the canoe livery put-in at County Road 1075 and foolishly left my rain gear and camera dry box in the canoe while I wandered around. I hadn’t seen the dark clouds lurking beyond the tree line and was ambushed by a sudden downpour. I covered the camera with my hat and ducked into a portable outhouse. Not the most pleasant place to hang out, but my camera stayed dry. 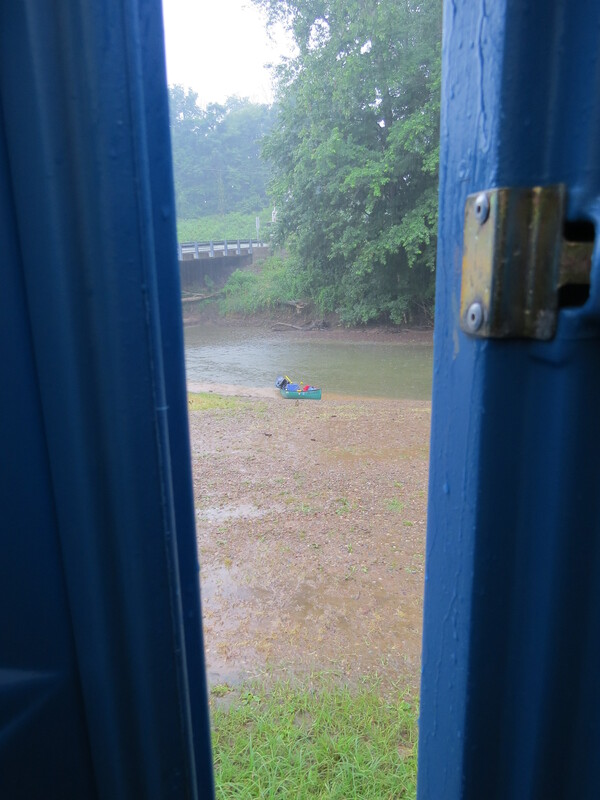 Seeing the world from a Port-A-John, just part of the adventure. Yes, that’s my canoe out there – where I left my rain gear. After about 20 minutes, the storm passed and I was on my way. Not far downstream from the livery put-in is the Greentown Indian village site. Between 1782 and 1812, more than 150 families — primarily members of the Delaware tribe — lived and farmed in the village. They had been driven from the East Coast by encroaching white settlers and struck up an alliance with the British. When hostilities between the U.S. and England came to a head in 1812, the American militia forcibly evicted the Greentown inhabitants, telling them they could return after tensions died down. As the soldiers ushered them to their new home in Piqua, some members of the militia stayed behind and torched their village. After paddling through Perrysville, I was waylaid by a second storm. I took shelter under the eaves of a maintenance building at the former Pleasant Hill Canoe Livery on State Route 39. The livery was established in the 1960s by Clayton Drouhard, who died in 2006. 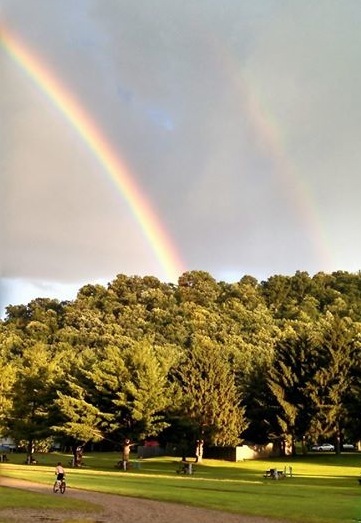 George and Amy Smith bought the property in 1999 and operated a livery and campground there before moving operations downstream to Smith’s Campground and Cabins south of Loudonville on Wally Road. The section of Black Fork between Perrysville and Loudonville figured prominently in the pre railroad era. According to regional historian Lee Cavin, farmers found it too costly to ship their grain, lumber and whiskey overland to Lake Erie ports, so they sent it by flatboat to New Orleans. In his book, “The Edge of Paradise … revisited, Loudonville, Ohio,” Cavin wrote that retired sailor John Bull, who initiated this practice locally in the early 1820s, “was joined on the river by other area entrepreneurs and boatyards flourished as far upstream as the entrance of Honey Creek … ” Flatboat operators dismantled their boats in New Orleans, sold the lumber and returned home on foot or by horseback. Honey Creek flows into Black Fork about halfway between Perrysville and Loudonville. It’s a nice quiet spot to stop for shore lunch. There were only a few hours of daylight left when I reached Loudonville, so I stopped to camp just outside of town. The land where I camped belongs to Becky Augustine. Over the years, I’ve gotten to know landowners along the river who allow me to camp on their property. 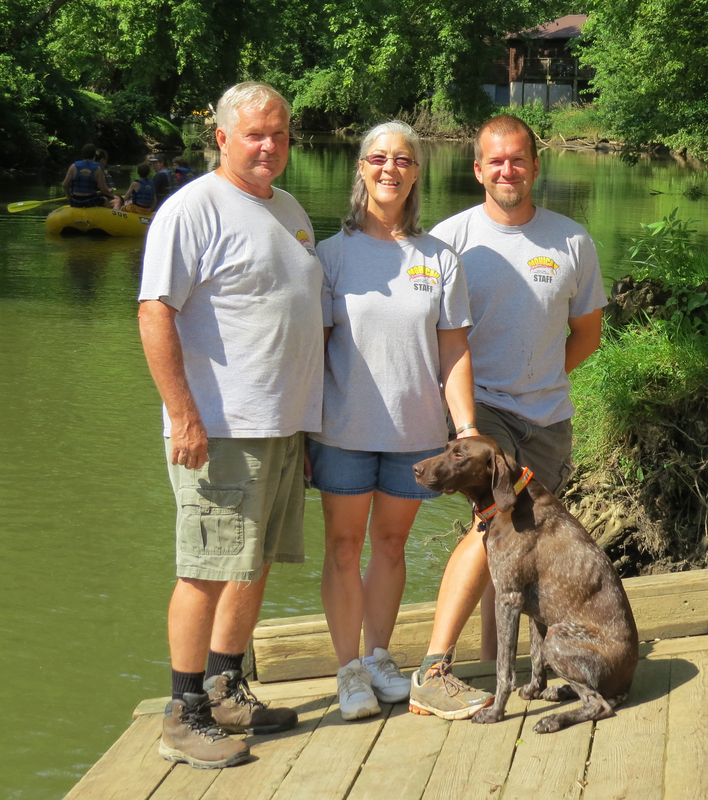 Mohican Adventures owners Doug and Patty Shannon, son-in-law Josh Gray and their dog Diesel — the folks who provided me with a venue to find my life’s passion. It wasn’t always that way. Like many canoe campers, I labored under the illusion in my earlier years that you could pretty much camp where you liked. That’s not the case. Most of the land along the banks, the islands and the riverbed itself are private property. The river is considered public property and paddlers can float on any navigable body of water in the state. But, step out of the canoe or kayak, and you’re technically trespassing. There’s peace of mind in knowing that, when you have the landowners’ blessings, you won’t be rousted from your tent in the middle of the night by police. Or, worse yet, by a gun-toting landowner. The first time I camped on the Augustine property, I was trespassing. That’s when I met the landowner’s husband, the late John “Moxie” Augustine. Moxie was accompanied by a Loudonville police officer. Moxie, who passed away in 2007, had a reputation for being a colorful character who was prone to using colorful language. On the day I met him, I was stooped over the campfire making breakfast. There were about eight people in our party, most of them still in their tents sleeping. We were a colorful bunch in our own right and our encampment looked like a Gypsy caravan with canoes in lieu of wagons. The police officer asked Moxie if he wanted to press trespassing charges. Although “stuff” was not the term he used. A few years later, I came to Ashland County to work at the Times-Gazette and got to know Moxie. He was a dispatcher for the Ashland Fire Department at the time and I always looked forward to visiting him on my daily rounds. I don’t often camp on the Augustine property. But, when I do, I enjoy reflecting on fond memories of Moxie and I always drink a toast in his honor. I enjoyed my stay at the campsite. The mosquitoes enjoyed it even more. I broke camp in the morning and canoed a short distance to the Mohican Adventures landing — the place of my rebirth. Every time I paddle by this spot, I look upon it with reverence. On this trip, I stopped and thanked the owners, Doug and Patty Shannon, for the role they played in helping me find my passion in life. I pressed on past the confluence and accepted George and Amy Smith’s longstanding offer to stop at their campground to socialize and sample a few specialty beers. I pitched camp and spent a relaxing afternoon watching the river flow, reflecting and writing. Mother Nature wasn’t done with me yet. Just before sunset, I got hit with another rain shower. It quickly passed, leaving a double rainbow in its wake — a fitting end to my Black Fork pilgrimage. Next week: The upper Black Fork — for extreme bushwhackers only. Perrysville was the home of the famous explorer and trapper, Jedediah Strong Smith, who left this area in 1821. He is credited for making the effective discovery of the South Pass, first man to reach California overland from the American frontier, first non-Native American to cross the Sierra Mountains and first to explore the Pacific Coast inlands from San Diego to the Columbia River. He saw more of the West than any man of his time, and was familiar with it from the Missouri River to the Pacific, from Mexico to Canada. Thanks for sharing that, Joe.